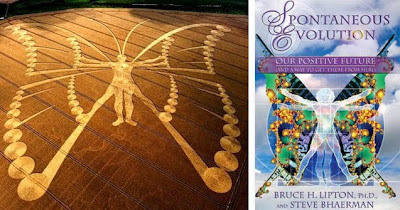 Spontaneous Evolution : Our Positive Future & How To Get There From Here is a book by Dr. Bruce Lipton and Steve Bhaerman (Swami Beyondananda) released in October 2008 as an audio book, was also recently released by the press around the same time the Amazing Human Butterfly Crop Circle appeared in Netherlands. 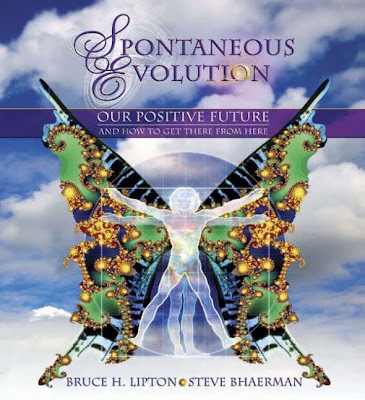 In Spontaneous Evolution: Our Positive Future (And A Way To Get There From Here), pioneering biologist Bruce H. Lipton, Ph.D. and political philosopher Steve Bhaerman team up to offer an insightful, playful, and hopeful look at the unfolding destiny of our species—and how you can play an active role in birthing the evolution of civilization. Many of the ideas and institutions that define our culture today are breaking down and that’s a good thing, say Lipton and Bhaerman. this is a necessary part of the natural process of clearing out what no longer serves us to make room for a new way of being that will carry us into the next age. Spontaneous Evolution is an insightful, playful, and ultimately hopeful look at the unfolding destiny of our species and how you can play an active role as a co-creator of the world to come. Join the evolution! Each of us is a powerful force in creating civilization’s positive future. Swami Beyondananda's Cosmic Hilareality ! Thank yoUNIVERSE for the ONEderful comment ! Timely Evolution ... All on schedule :D ! Now is when we allow our inner light shine through ... and begin to recognize the light within and all around us beyond the masks of the ego ... in the mind's eye of real~eyes~a~tion the self is discovered as one with creation ... ever flowing ... ever evolving ... ♥ ALL~Ways in good motion ... into the ocean ! Sou de Salvador - Brasil. E estou gostando muito desse site, parabens! 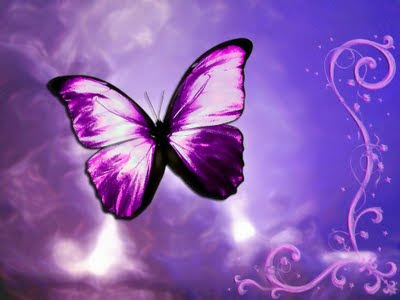 we have no difference between human,animals and plants...theres no something made instantly,as same like us or *butterfly*,many people in indonesia have a question:"whats happening with me? "they say"...hmm i knew it cause thee mother of universe wants us to change,follow the river of life without dubt...and suddently you'll change with or without you realize it...its time to evolution...it is the time...N O W !! !